Based on true events, “Life Boat” revolves around six teenagers who are led into an intriguing game of survival by their guidance counselor. We live in a time where teachers tend to err on the side of caution and sensitivity when dealing with students because crossing a line might cause them to lose the trust of their charges (or their jobs). While positive reinforcement feels like the status quo, and self-esteem the highest goal, it’s not hard to find contrarian opinions that deride a culture where “every kid gets a trophy”, and for whom excessive positivity is creating an sheltered, entitled generation. You never want to condone abuse, but is there something to be said for “tough love”? Life Boat uncomfortably marches right up to that line to test our preconceptions. Set in a boarding school for wayward youths, a guidance counselor brings six students’ innermost issues to the surface in humiliating ways–in turn, daring them to care about their lives by playing a game that requires them to grab a spot on a “life boat” with only three seats. Helmed by actress-turned-director Lorraine Nicholson, the film is an exercise in what you can accomplish with a single location and a talented cast. Instead of using fancy camera moves and crazy plot twists, the film grabs hold of something more true-to-life, relying mostly on dialogue and body language to create a tense, uncomfortable atmosphere. That is not say that the production quality is lacking— shot by acclaimed DP and Beyonce collaborator, Jackson Hunt, the image has a cool tone that complements its clinical setting. Rehearsed and performed like a play, the cast stayed in character throughout with two Alexas constantly rolling, helping the remarkable cast reach an additional layer of authenticity. 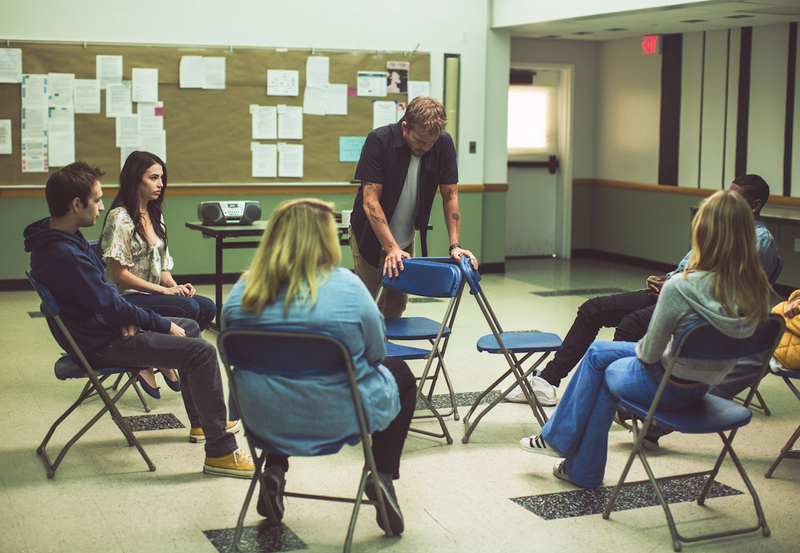 Stephen Dorff plays the critical role of guidance counselor with aplomb—a tough cynic who is prone to verbal abuse and criticism, it’s unclear what his goal is as the plot unfolds, and as the situation starts to escalate in shocking ways, it’s hard to tell if his unconventional methods are helpful or hurtful. Part of the reason Life Boat feels so realistic is that these “therapeutic boarding schools” actually exist. In fact, Nicholson’s producing partner Elizabeth Gilpin was sent to one when she was younger. After hearing about these places (and their unorthodox reform style) Nicholson decided to use them as the subject for a short film. “As I started digging deeper, conducting interviews – I found a surprising new perspective,” writes Nicholson. “Despite the harshness of the methods, many students felt that they owed their adult lives to these schools. That without them they’d be on the street, or worse.” The cast of actors is composed of fresh and familiar faces, and they do a wonderful job of playing characters that are equal parts scared, arrogant, and apathetic. Though the dialogue is quite wordy, it doesn’t feel written at all. At times, the methods the guidance counselor uses become problematic, and he doesn’t step in or stop his exercises when things get heated. Will there be any positive consequences to his unflinching negativity? Or is the teacher just fond of torturing wayward students? Life Boat doubles down on the ethical murkiness of the counselor’s methods and forces the viewer to come to their own conclusions about the effectiveness of this so-called therapy. Over the span of eighteen minutes, the counselor creates a decidedly un-safe space where each student is forced to decide if they want to to sink further into the damaging habits of their past, or swim to the surface in search of solutions. In tandem with a successful acting career, this is Nicholson’s third short film as a director. Selected by the Tribeca Film Festival and winner of the audience prize at the Napa Valley Film Festival, Nicholson’s adept handling of actors bodes well for her future work. A participant in the prestigious AFI Directing Lab for Women, the resulting short film On Killer Robots just recently premiered in L.A.